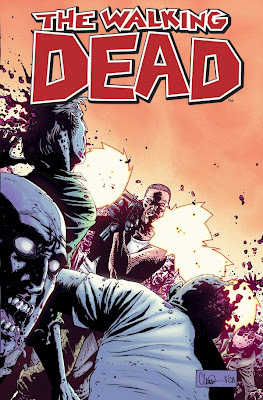 This is the cover art for The Walking Dead #54, a planned August 2008 release from Image. It was posted on the Kirkman board at Image, but there is no link to an official solicitation. The cover art follows on neatly from issue #53, where we get a first glimpse of some new characters. Well, it looks like they could be sticking around for a while. This cover is proclaiming that there will be more action, more Zombies, and those Zombies are getting got. Gun n' run. Love it. Have we seen the last of Rick and Carl for now? Is The Walking Dead now following the lives of others as the main storyline??? Let us hope it is August 2008 when we get the answers to these questions (though it would not be unrealistic to expect to get issue #54 anytime around the Autumn).